The term full braces indicate that braces are placed on most, if not all, teeth on both the upper and lower jaw. Cases that are complicated and require much more teeth movement or movement for improved jaw alignment and overall bite would indicate the need for an individual to have full braces. 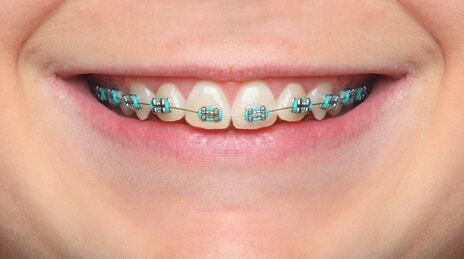 It may not always be obvious that correction with braces is needed. In some cases, the front teeth look straight, however, problems may exist with the alignment of the jaw or issues exist with the bite that require correction by orthodontic treatment. Dr. Magoulas looks at all of these parameters during his consult, in which he refers to both an oral exam and dental X-rays for the diagnosis. Dr. Magoulas will determine if full braces are necessary at the initial visit or consult and recommend the appropriate individualized treatment plan that is best for you. Orthodontic treatment starts with the placement of brackets on each individual tooth. The patient has a choice of either metal or clear brackets. Orthodontic bands are usually placed on the molars instead of brackets. Over the years, technology has improved the quality of clear brackets and they are just as durable as the metal brackets. The clear brackets (which are made of strong ceramic material) as well as the metal brackets do not stain. Both types are used at Shrewsbury Orthodontics. They are smaller in size, which provides overall increased patient comfort, ease of getting used to and easier to clean due to their slim line design. Once the brackets are on the teeth, special orthodontic wire is placed into slots on the brackets and this starts the movement of teeth. Over time, Dr. Magoulas will change the wire when necessary to achieve continued movement and alignment of teeth. Many children customize the look of their braces by choosing different color rubber band elastics which are placed on the brackets to help hold the wire in place. Clear rubber bands are also available for those that choose not to have colors. The rubber band elastics are changed at every visit. Orthodontic visits are usually once a month until Dr. Magoulas achieves optimal alignment of teeth, jaw and bite. Each case is individual and the length of time necessary can vary, however most cases take between 18-24 months.